I first saw this photo somewhere, can't remember where, but I had to track down the original.. which apparently was published two years ago at a site called "O Bite It".. very clever for a food blog, I must admit! Just a quick description before I send you off to OhBiteIt for the specifics.. The vodka (or perhaps another alcoholic beverage) replaces the water in the Jello recipe. So simple! In this recipe you carefully cut off and save those bunny ears and later "glue" them back on with whipped cream. 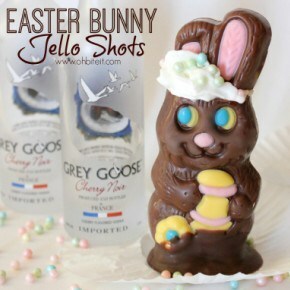 Boozed Up Bunny Jello Shots from Oh Bite It HERE!